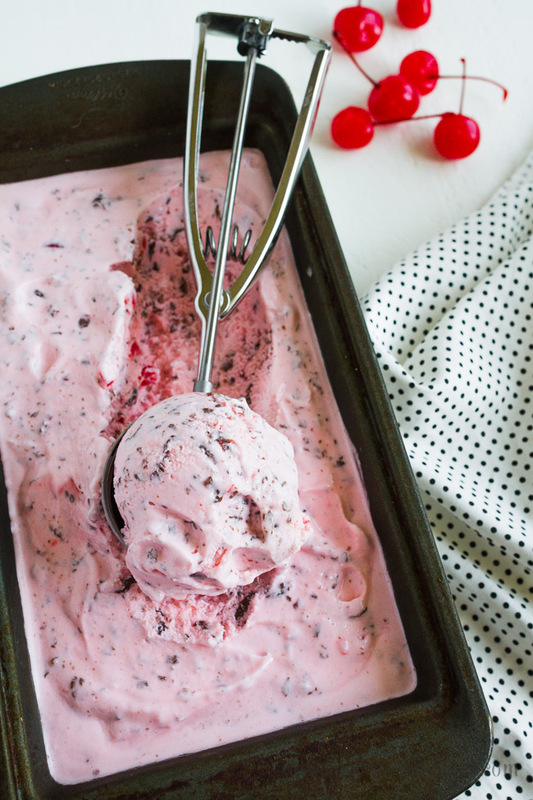 Homemade Cherry Chocolate Chip Ice Cream is insanely good! Will you keep a secret for me? I don’t like maraschino cherries. My husband does so I don’t turn them down when I get a shake or sundae at a restaurant. My oldest son goes crazy for them and Santa has even put whole jars in his stocking at Christmas time. They just aren’t my thing. That’s why I was surprised when this recipe popped into my mind just a few weeks ago. I was talking to a friend who had made my Mint Chocolate Chip Ice Cream. She was shocked to find out what my secret ingredient was. 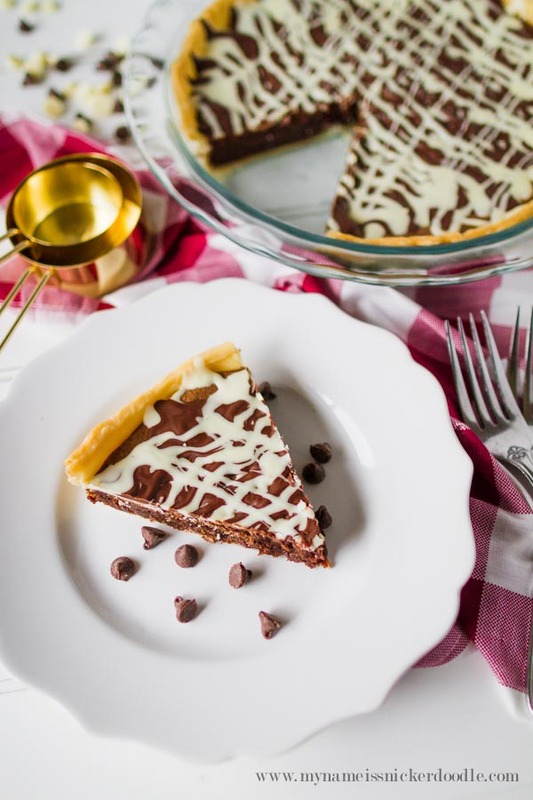 It makes for the BEST chocolate chips and said her whole family loved it! 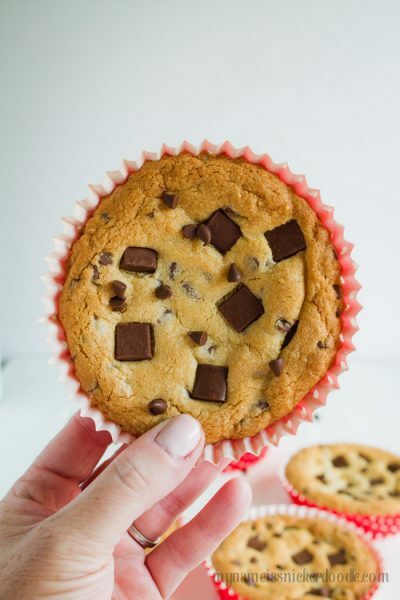 I was thinking about what else I could use that famous secret ingredient in and that’s when Cherry Chocolate Chip popped into my mind. It’s a flavor that I don’t even give a second thought to when perusing the ice cream isle. At that very moment, though, it sounded so heavenly. I got to work the very next to perfect the recipe and I have to tell you, it wasn’t terribly difficult. All I did was follow my basic rules for an easy ice cream base and added from there. 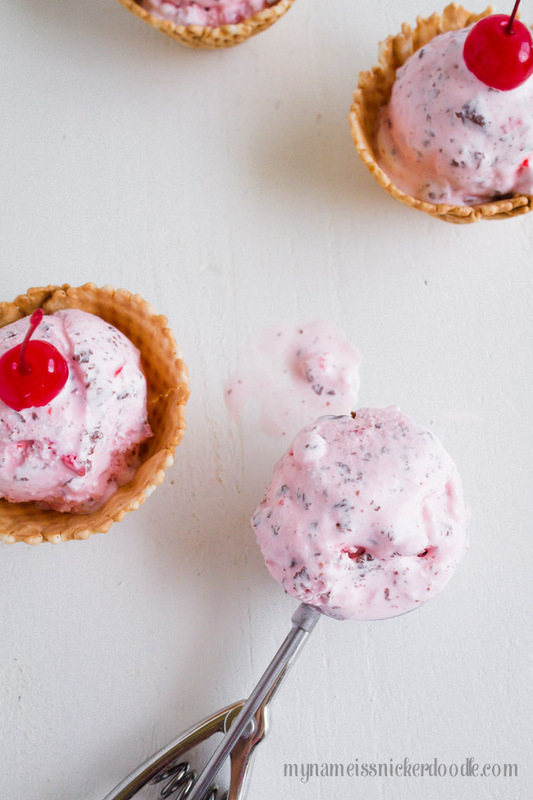 I knew it was going to be the first homemade ice cream in my week long series! 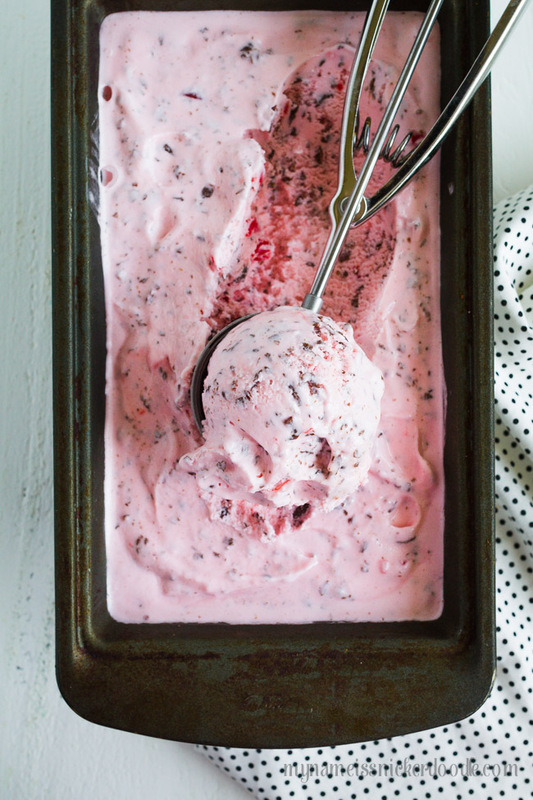 Yesterday I shared all my tips and tools that make homemade ice cream a whole lot easier at home. You truly only need a few ingredients. A tip I forgot to share is keep all of your ingredients chilling in the fridge until you are ready to use them. That just helps the ice cream form a little quicker. Something else that many people don’t know is when you use an ice cream maker, it will only bring it to soft serve temperature. 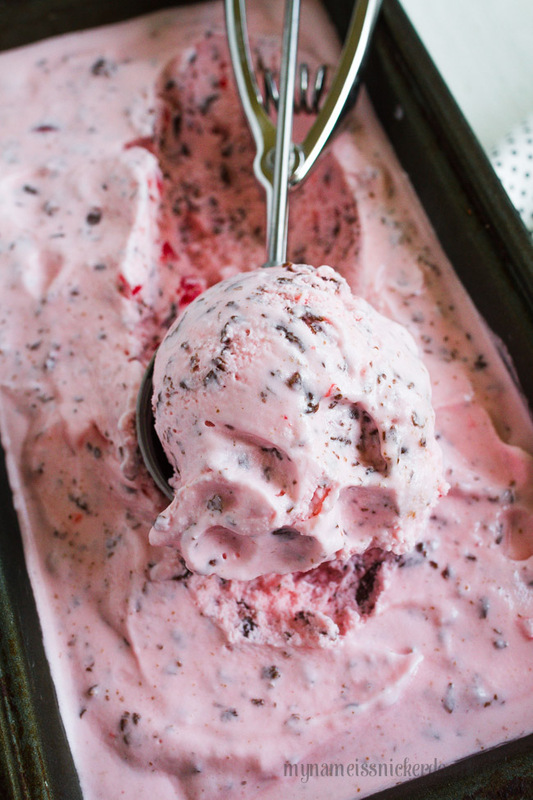 If you want hard ice cream, you will still need to stick in the freezer for 2 hours or more for it to harden up. 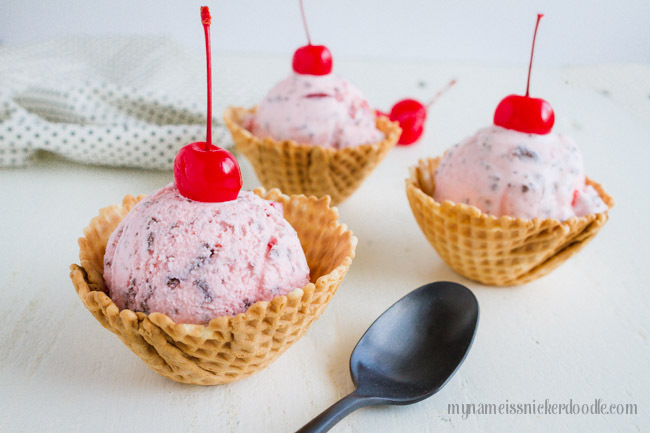 I chopped my cherries really fine because I don’t like chunks in my ice cream. You could cut them in half if you don’t mind them. 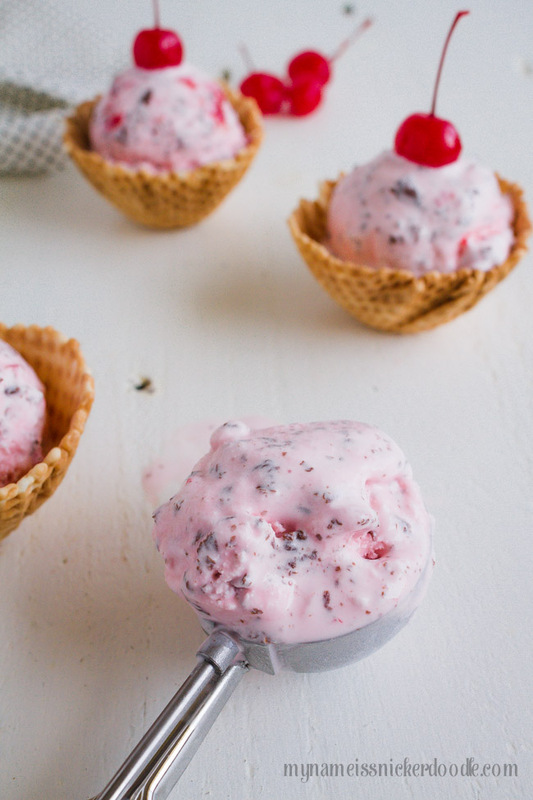 The flavor in this homemade ice cream is incredible! 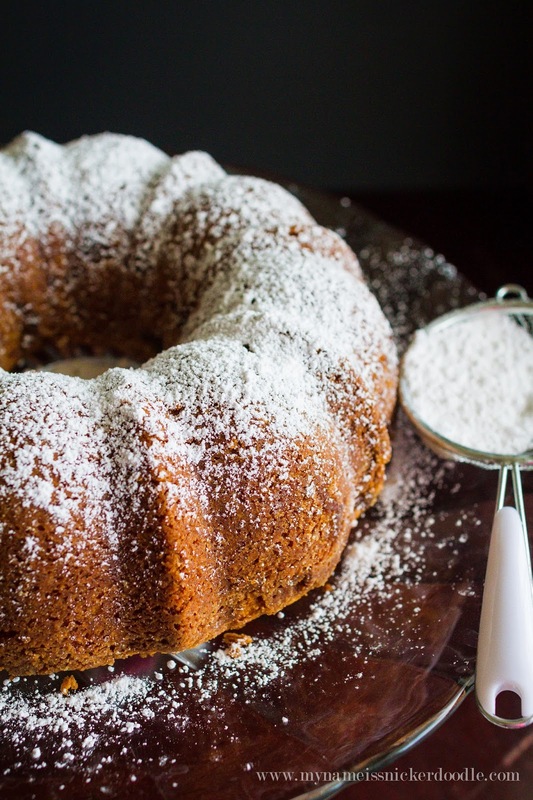 It comes from a little almond extract and some maraschino cherry juice! That’s also what makes it this perfect pink! 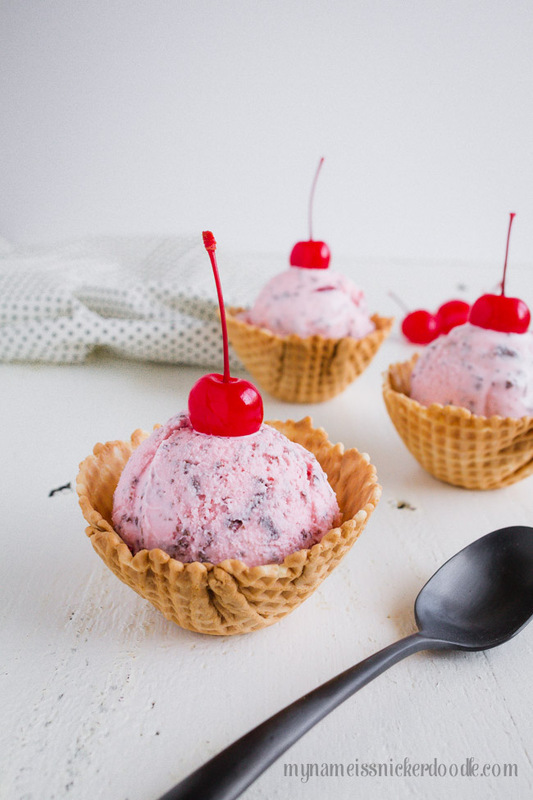 Homemade Cherry Chocolate Chip Ice Cream is insanely good! 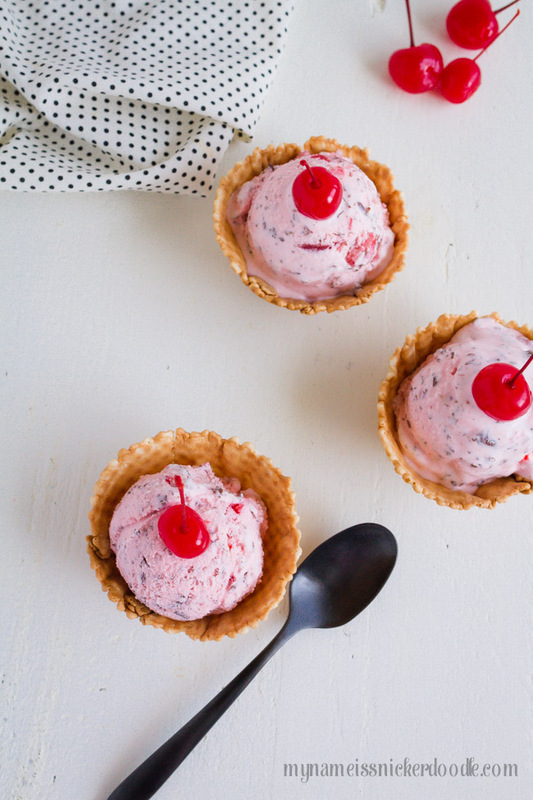 It’s simply flavored with a little almond extract and maraschino cherry juice. 1 Bottle Chocolate Magic Shell. Add in almond extract and maraschino cherry juice. Once it has started to firm up and get semi frozen, toss in chopped cherries and drizzle in Magic Shell a little at a time. Once some has mixed in, drizzle in more. This will create chips. Repeat this until all the bottle is empty.